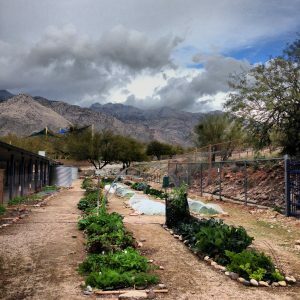 Every day is a beautiful day in the Sunrise Drive Community Garden! 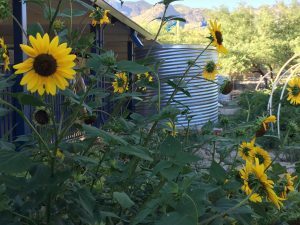 Our garden was built in 2008 as a cooperative effort between Sunrise Drive and the Community Gardens of Tucson (CGT). 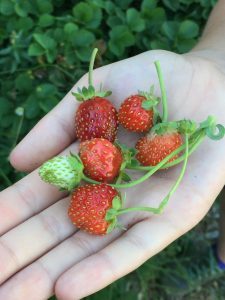 Throughout the year, children, parents, and teachers are actively involved in planting, harvesting, and maintaining their garden plots. CGT maintains the irrigation lines and fencing and owns some of the equipment in the shed. Gardeners, who might not be affiliated with the school, pay CGT for use of most of several of the plots in the garden. We also have three Sub Irrigated Planters – a unique type of raised bed was built from steel watering troughs. These planters store and conserve water, and use a unique “dirt-less” soil mixture based on coconut coir, perlite, vermiculite, and natural compost. What: Work in the garden with Sunrise students. We make it easy by providing an irrigated plot, seeds, tools, and all instructions! Being a Garden Parent is a great way to learn about gardening in the desert and get to know your child’s classmates. If you are interested in helping out or want more information, please let your child’s teacher know, or contact us! When: Wednesdays from 11:40-1:00 (lunch recess). Pick and Choose which weeks you can help. Even one Wednesday a year is appreciated! Starts November 3. What: Supervise the children tending to the school plots. Light gardening. No experience necessary!